Bruxism is a term used to describe a condition that includes teeth grinding and or jaw clenching. This bad habit is very common and it affects a wide number of adults and children. Teeth grinding can happen at any age and it is usually accompanied with the rhythmical clenching of the jaw. If this happens only occasionally it shouldn’t cause any serious problems. But if it happens on regular basis, the consequences will be more severe. There are two types of bruxism, one that happens while patients are awake (awake bruxism), while the other one happens during sleep (sleep bruxism). Knowing about bruxism, the symptoms, and the early diagnosis can be very important in improving the outcome of the therapy. A lot of people are not aware that they are suffering from bruxism. That is mostly because it happens during sleep and it doesn’t show any symptoms for a long time. That way patients are not really aware of what they are doing during the night. In most cases, other people such as wife or husband, hear the sounds of clenching when they accidentally wake up at night. Since patients do it unconsciously, in the morning they wake up with a sore feeling in the jaws and teeth. It can also happen in daytime, when it is associated with stress, lifting heavy objects or doing other tasks. Knowing the symptoms of bruxism can be very important. If the disorder is mild, it usually doesn’t cause any problems. The thing with bruxism is that patients become aware of it, once the changes become more serious and irreversible. If you are familiar with the signs and symptoms, you will know when to seek for further dental help. Headaches and facial pain are the most common symptoms that can point out to teeth grinding. These patients experience three times more headaches compared to the ones that do not suffer from bruxism. In the beginning, the headaches cannot be connected with this condition, and it can be very hard to properly diagnose it. 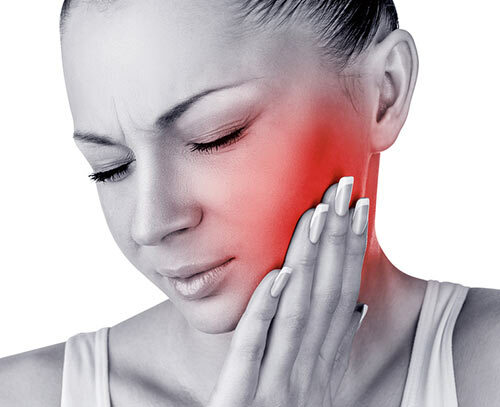 Facial pain is another sign that you might be suffering from teeth grinding. You will feel a sharp pain located in the temporomandibular joint, earache, sore and painful muscles and more. With time, facial muscles can become enlarged. When they wake up in the morning, people usually experience pain in the area of the joint, and unfortunately, that can lead to several TMJ disorders. Teeth do suffer a lot of damage from the pressure and force during clenching and grinding. Most of the patients notice their worn-down teeth and that is the moment they decide to visit the dentists. Cracks and chips can occur. The damage cannot be reversed, and if the condition is not treated the loss of tooth substance will continue to happen. In more advanced stages, teeth might become mobile and some patients even lose their teeth. There is a variety of factors that can lead to bruxism. There isn’t any strong evidence that point out to only one reason, or completely explain the process. The latest research strongly associates bruxism with sleep problems, stress, medication, alcoholism, and smoking. There is also a theory that connects teeth grinding with genetics. In other words, it can appear more frequently in one family compared with another. The first and most important one is stress. Stress and anxiety are a part of the everyday life, and play a big role in a lot of diseases and health disorders. Unfortunately, it can be really hard to influence on this factor or eliminate it, since it doesn’t only depend on us. We are affected by the environment at all times, and that can have a big impact on bad habits such as teeth grinding and jaw clenching. In most cases, people aren’t aware that they are suffering from this condition, and when they are- they don’t associate it with stress. People that work in stressful work environments are constantly under some type of pressure are more likely to develop this disorder. Bruxism can also happen as a side effect to several types of medication. Certain antidepressants are known to lead to this disorder. The one that is placed high on the list is the selective serotonin reuptake inhibitor (SSRI). Sertraline, paroxetine, and fluoxetine are several examples of this type of antidepressant. Common drinking and smoking are strongly related to this condition. Also, many types of drugs are known factors that cause bruxism. Sleep disorders such as sleep apnea, snoring, violent dreams, hallucinations can lead to teeth grinding. Obstructive sleep apnea is a very common disease that should be taken care of in time. Sleep paralysis is also commonly associated with teeth clenching. Unfortunately, your favorite caffeinated drinks might be causing you to clench your jaws and grind your teeth. Overly-consuming coffee and tea can lead to bruxism. We are talking about six and more cups a day. Aggressive people, overachievers, people that are easily affected by anxiety do show the tendency to develop bruxism more often. Also, patients that are suffering from mental diseases such as Alzheimer’s and Parkinson’s might show symptoms of jaw clenching. ADHD, dementia, epilepsy might also be connected with this conditions. The treatment mostly depends on the severity of the case. The first step, just like with any other condition is to find the reason that provokes the clenching and grinding. The dentist will be able to help you determine the factor and advise you on how to reduce or eliminate it. If it is stress, then there are numerous relaxation techniques that you can try. They will reduce the anxiety levels and help you relax and sleep much better. Stress management therapy is another way to go. Yoga and meditation can be extremely helpful. Massage, listening to music, cognitive behavior therapy, reading, are also options to look at. The damage that has been caused to the teeth should be taken care of immediately to prevent any further complications. All of the lost substance should be repaired. It mostly depends on the amount. If there is only a slight loss, it can be done with fillings, if not crowns and bridges might be necessary. Mouth guards and mouth splints are prescribed for patients to wear while asleep. They significantly reduce the forces that do the damage. These guards and splints will even out the pressure and protect your teeth and joint. They are not a solution to the problem, but these appliances will ease the symptoms and probably prevent further damage. All of the bad habits such as smoking, excessive drinking, and drug use should be at least reduced. The same thing applies for caffeine intake.